Make the stock: remove all the usable turkey meat from the turkey carcass to save for making sandwiches later or for adding to the soup. Break up the bones of the carcass, and put into a large stock pot (can include some leftover skin, as well) along with enough cold water to just cover it. Add the onion, carrots, celery, thyme sprigs, a bay leaf and some peppercorns. Bring to a boil and immediately reduce heat to bring the stock to a bare simmer or just below a simmer. Skim off any foam that may float to the surface of the stock. Add salt and pepper, and cook for at least 4 hours, uncovered or partially uncovered (so the stock reduces), occasionally skimming off any foam that comes to the surface. Remove the bones and veggies and strain the stock (ideally through a very fine mesh strainer). Allow to cool if storing for future use. Make the soup: Sauté the carrots, onions, and celery until just translucent; place in a large stockpot and add turkey stock. Add the thyme, garlic, and poultry seasoning. You can add rice, noodles, or pasta, cooking to the specified time on the packaging. 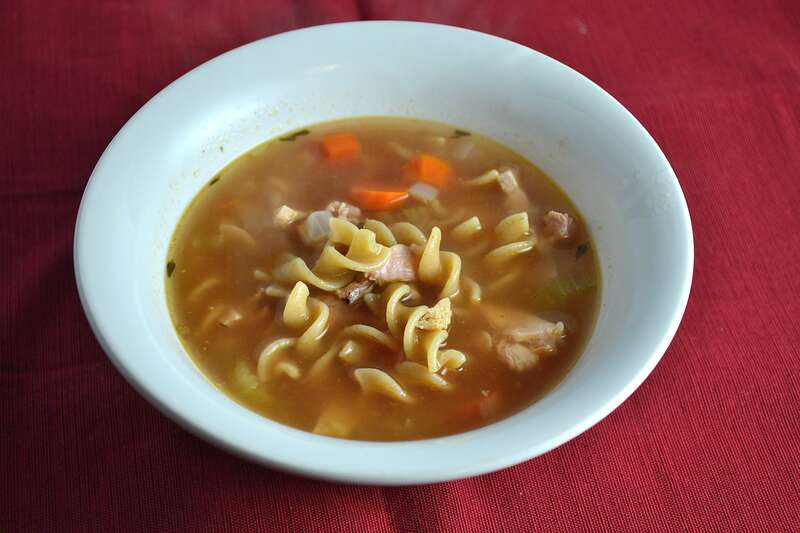 Take some of the remaining turkey meat you reserved earlier, shred it into bite sized pieces and add to the soup. Add the chopped tomatoes, and salt and pepper to taste. Serve immediately or refrigerate/freeze.